Apply for a Visa Credit Card Online! Contact us immediately if you feel your card is lost or has been stolen. Easily pay online with Visa Checkout at your favorite stores. Enroll in Visa Checkout. Get a text or email whenever you pay with your Visa card. Enroll in Visa Alerts. Provides automatic updated account information to participating merchants when processing your recurring payments. For more information on Visa Account Updater Service or to opt out, click here. How to Avoid Paying Interest on Purchases Your due date is at least 25 days after the close of each billing cycle. We will not charge you any interest on purchases if you pay your entire balance by the due date each month. How We Will Calculate Your Balance: We use a method called “average daily balance (excluding new purchases)”. Effective Date: The information about the costs of the card described in this application is accurate as of January 22, 2016. This information may have changed after that date. To find out what may have changed, contact the Credit Union. Late Payment Fee – $10.00 or the amount of the required minimum payment, whichever is less, if you are 20 or more days late in making a payment. Q: What is the benefit of a chip card? A: Chip cards are a standard payment method around the world, so having this feature makes purchasing abroad much easier. A card with a microchip is more secure than one with just a magnetic stripe on the back because the account information is encrypted in the chip making it more difficult to fraudulently copy the card details. Q: Will my card work outside the United States? A: Yes. Your chip card will work at merchants processing transactions using a chip-enabled terminal or using a magnetic stripe reader. Your chip card can be used anywhere in the world where Visa cards are accepted. Q: Can I use my card for everyday transactions domestically? A: Yes. In addition to the embedded microchip, your card has a magnetic stripe on the back. 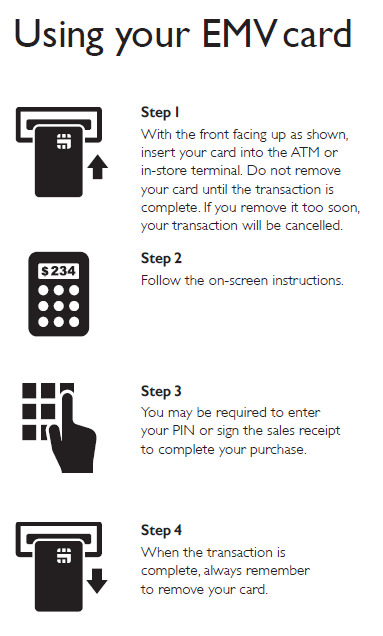 That way you can make purchases by swiping your card and signing the receipt. You can also use your card at ATMs. Q: Now that I have a chip card should I continue to notify you before I travel internationally? A: Yes. Advance notification will help ensure that legitimate purchases are approved. Q: Whom can I contact if I have questions or concerns about my Maine Highlands Federal Credit Union chip card?